What are RC (Remote Control) Cars? How to choose the best remote control car for kids (and adults)? Mike here with ScannerAnswers to bring you a different article than our usual. Around here we talk a lot about wireless OBDII scanners, radar detectors, and other cool car accessories. But today we’re talking about the best hobby rc cars and trucks of 2019. The other day the guys and I had a slow day at the shop and Vince came by with a radio controlled TOQIBO Rock Crawler. For those of you not tuned into all the different remote control cars, the Toqibo looks like a yellow Cheetah mounted on wheels! Needless to say we were all excited to race it around the shop and eventually made our way outside to take the “Screamin Cheetah” out for a spin. It was a good day! Below you’ll find 5 of (what we believe) are the best hobby remote control cars for the budget conscious. These are all rc cars less that 100 bucks and are great for all ages! Okay, let’s look into the pros and cons of each of these choices. Now mind you, these are pretty cheap electric cars and so they aren’t meant for heavy duty use. But they are a blast to race around the shop and take for a spin outside. Plus, they’ll keep your kids busy for hours! Let’s get into the reviews and pros and cons. Independent suspension – rechargeable batteries – easy to learn controls – great durable frame – much more! We’ll give it to you straight, this remote control car is the best we could find for the value. 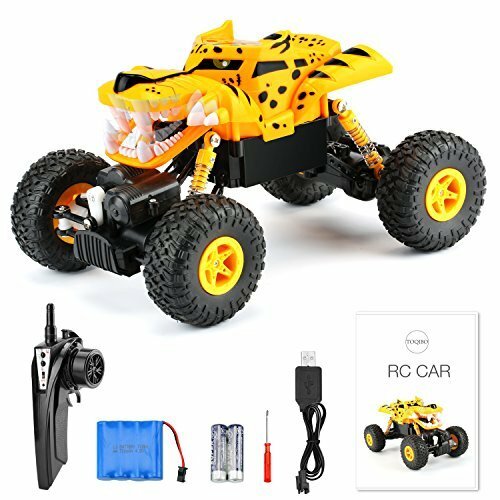 It’s an eye-catching RC car for kids and adults. Any kid will love playing with this bright yellow car with a monstrous head on top. Adults will love the exceptional handling and technical features. So, get ready for some serious family fun! This item falls into an affordable price region for most people. The car is designed for performance more than speed. The top speed of 10 KM/H is acceptable, but not for those who are more into racing. This item showcases all the features that make RC cars an enjoyable family activity. Because it’s affordable and durable, you can’t go wrong when this is your preferred option. Easy to operate: When the vehicle is not in direct motion, you can automatically adjust the vehicle and there is a direction at the bottom of the rotator. 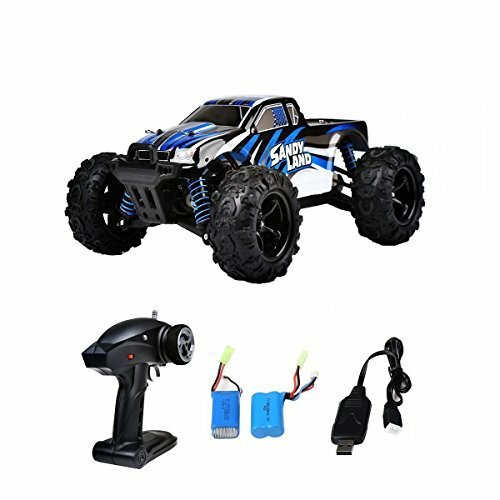 2.4GHz frequency: 2.4Ghz radio technology, which can be controlled more accurately without interference, and several rc cars are competitive at the same time. 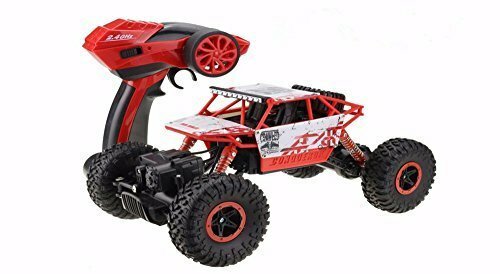 Affordable electric race buggy – rechargable quick charging battery – Flexible and shockproof body – great rc car for kids! Our first choice is the DeXop. These make the perfect hobby rc cars for beginners because they are low cost, low maintenance, easy to setup and use, and pretty durable. DeXop puts various features together that will allow owners to enjoy hours of fun on off-road courses. Many DeXop customers can’t get enough of this model that looks as stunning as it performs well. Why should you make it part of your collection? This is an ideal remote control truck/buggy to purchase for the whole family’s enjoyment. 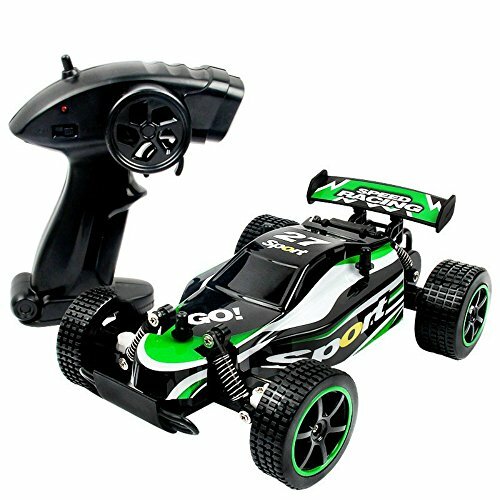 It’s one of the best remote control car for 10 year old and adults! It has all the basic features while being durable, so you don’t have to be concerned when it’s time for the kids to have some fun. It’s much more affordable than the professional cars, so it makes sense for your budget as well. Low cost electric all terrain remote control buggy – 2 hour charge for about 20 minutes drive time – Can race 5 or more cars! The Rabing is another great RC car for beginners and kids. It’s a cheap rc buggy, but an inexpensive cheap. The quality is very good for this price range. It’s designed on 1:20 scale. The sporty paintwork and attention to detail look stunning. Apart from this, its features cover various requirements you may have. Let’s look at a few. You’ll love enjoying the outdoors with this RC car, or using it indoors when the weather is bad. The whole family can take part, as it’s easy to control. At the affordable price, it’s the ideal gift to purchase for the whole family. Purchase comes with an extra, large-capacity battery for additional playing time. Shockproof: The four wheels of the car utilize a suspension shockproof system that protects it from damages caused by vibrations and many shocks. Let’s talk about some of the facts. It’s one of the more expensive RC cars of its type. It’s only available in one design. 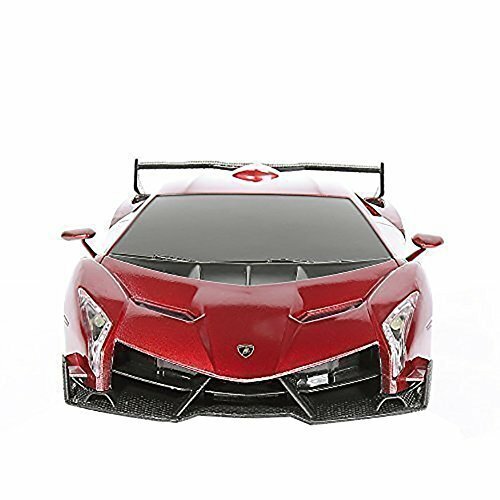 Cool looking RC car that is great for racing on even surfaces – Lamborghini style at a low price! This car impresses even when it’s simply standing still, thanks to its stunning sports car exterior. When you start driving it, you’ll be impressed even further. It’s a car and not an off-road RC truck, so you need to use it in situations where it won’t get damaged; you can’t attempt mounting rocks or sand heaps. As long as you use it for what it was designed, you’ll love owning this sleek, small Lamborghini. Quality control on these cars could be improved. The first car we got wouldn’t turn to the left. We returned it and got a working replacement without much hassle. This is a stunning design, but not the most practical. The car is small and it’s not known for its durability or quality of the parts. It’s not expensive, which reflects in the quality. This could make an excellent gift for a boy, but should not be part of a professional’s fleet, as it may only cause frustration. Racing RC Cars is a favorite pastime for many. This includes people of all genders, ages and backgrounds. While fun should be the main consideration in any hobby, you’ll love how quality components can enhance this activity. This review is put together to help you see what your options are when it’s time to purchase a new RC car. Your current car may need to be replaced and if you make the correct decision in terms of quality and features, you’ll wonder why you didn’t make the swap earlier. Let’s look at what you should consider when choosing your ideal item from the list of best RC cars on the market. As mentioned, remote-controlled (RC) cars are loved by all types of people, but that doesn’t mean every RC car will fulfill your requirements. You can easily determine what is appropriate for yourself, or for someone else if you’re purchasing it as a gift, by keeping these facts in mind. Who will use the it the most? Children require different features than adults as they may need simplified features to get the most enjoyment out of the car. Adults, who have move knowledge about technical aspects, want RC cars that allow for many modifications (they they can get expensive!). If a car is left in children’s hands, you should consider aspects such as waterproofing and durability, since the car is bound to be dropped wherever, and handled rough. Where will the radio-controlled vehicle be used? Some remote control cars are made to ride on rough terrain. If you take other RC cars on this terrain, you’re bound to cause damage to your toy. The market is flooded with cars of every type, design and price range. There are RC cars for beginners, remote control cars for adults, and rc trucks. You’re sure to find one that fits your requirements more or less, even if you are looking for the best rc cars under 100. Leave the more expensive ones to those who can also afford to fix the rc cars. RC cars invariably get bumped and damaged, so it doesn’t make sense to spend too much money if your budget won’t allow for repairs to such an expensive item. This type is built for speed, not durability. You need a smooth stretch of road to enjoy them. The focus with these RC vehicles is to have fun on off-road terrains. They feature 4- and 2-wheel drive actions to help them get over rocks and sand. They’re durable enough to handle the bumps and falls they may go through along these rough courses. These terrains also require them to be waterproof. These RC vehicles are a mix of cars and trucks. Though they may not perform as well on rocks or go as fast, they’re popular because owners can take them to almost any terrain and have a lot of fun. Will 2WD or 4WD be the best for the activities you plan? The TOQIBO is by far the winner in this contest. It looks stunning and it performs well. Any age will love it, so it fulfills much of what your wish list contains. Start having fun today and add this to your fleet at home. We hope you enjoyed this guide to choosing the best remote control cars and trucks for kids and adults. If you have any questions, please drop them in a comment below or contact us. Mike here with ScannerAnswers to bring you a different article than our usual. Today we're talking about the best hobby rc cars and trucks.